Looks and grows much like pineapple sage but has a stunning honeydew melon scent. There is nothing else like it in the world of herbs! Red flowers are edible, and they are favourite haunts of hummingbirds. Prefers filtered light but can tolerate full sun. 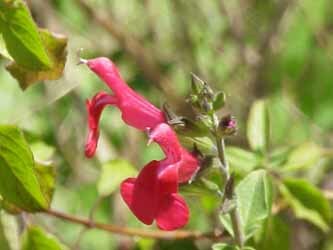 Reaches 1-1.3m/40-50”, but can be grown in hanging baskets.